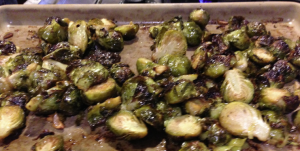 Wash 1 lb of organic Brussels sprouts off and let dry in collander before slicing in half. Pour Brussels sprouts on bacon fat pan (which means you’ve got to join me in this new tradition of making bacon for breakfast on Thanksgiving). Drizzle a little olive oil on top for flavor complexity, about 1 Tbs. Slice 2 garlic cloves in half and add to the mix. Thinly slice 1 leek over sprouts. Get your hands dirty: mix it all up so that the Brussels sprouts are covered in the delicious mixture. Cover with foil and bake for 45 mins on 250. Take off foil and broil on low for 2-5 mins until outside of sprouts are slightly crispy. Enjoy! These are the best Brussels sprouts I’ve ever had. Noms. Avoid sabotaging your hard earned healthy habits and ensure continued success on Thanksgiving (and the rest of the year) with these life preserver tips! 1) Get a health sponsor. Choose a friend or family member you can trust or a professional health advocate…anyone you can trust to be there for you to text, call or talk with in person when you need reminders or help with stress management around the holidays. 2) Take a long time to finish your meal. Seriously, make it a goal to take at least 20 minutes to enjoy your meal. avoid eating rapidly. The practice of being mindful and thankful is more sustaining to feelings of pleasure than the short-lived pleasure of the tasty food itself. I’m not a big turkey fan. 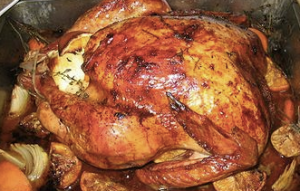 For all of you out there groaning over the anticipation of eating turkey for Thanksgiving, this recipe is for you. 1 boneless or bone in ham, about 5 lbs. (I prefer bone-in ham. Use the leftovers to make my delicious creamy ham soup). Combine first 7 ingredients and pepper to taste in a heavy saucepan. Bring to a boil, stirring about 1 minute. Set aside to cool. Cut diamond pattern on the outside of ham. Place ham on a lightly oiled roasting rack with a shallow roasting pan below OR place ham and glaze in a deep baking dish (it tastes great either way, less cleanup with second option). Brush syrup mixture over ham. 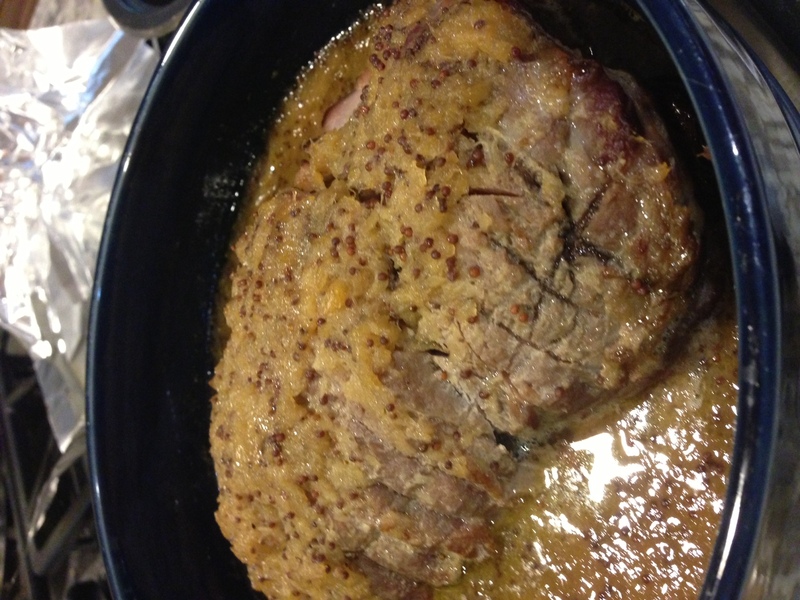 Bake 5 minutes, reduce heat to 325°F, and bake another 60-70 mins, basting with syrup mixture every 20-30 minutes. Remove ham from oven and set aside 15 minutes before slicing. This recipe is higher in sugar than most of my recipes. If your blood sugar is sensitive or you know that eating a lot of carbs increases your food cravings, go easy on the glaze. Serve with a low starch veggie like green beans, asparagus, zucchini or a lovely green salad. Thanks for all the positive feedback from last week’s Thanksgiving Recipes Reinvented newsletter–so glad to hear that many of you are looking forward to trying new, healthier recipes for your holiday this year! 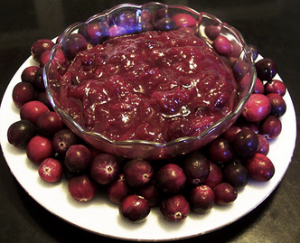 I’ve got a few more for you: cranberry sauce, a couple of gravy recipes, AND another stuffing recipe. The best part? All of these recipes are sugar-free, grain-free, gluten-free, easy, healthy and TASTY. My kind of cookin’! In a large soup pot, add the cranberries, water, apple juice, and orange juice and bring to a boil. Add the ginger, cinnamon, and honey and simmer, stirring often until the cranberries are broken down and the sauce becomes thick, about 10-15 minutes. Compliments of Everyday Paleo. 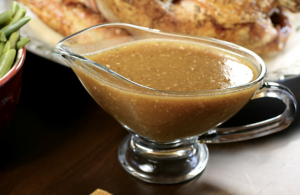 If you want to keep your gravy incredibly simple, just take all the drippings and scraps from your turkey pan and mix in blender or food processor. Pour into a gravy boat and enjoy. Compliments of Primal Palate. 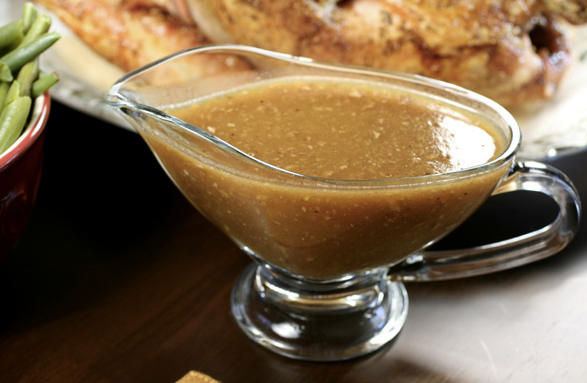 You can either make this gravy in the pan your roasted the turkey or a small sauce pan. Take the pan drippings and chicken broth and bring to a boil. Take a whisk in add in coconut flour and whisk vigorously so you don’t create any lumps. Add the remainder of the ingredients except for the salt. Taste the gravy then if you need salt to taste then add. Mmm, sausage. No bread. No starchy carbs. Just herby, meaty goodness to serve alongside your turkey and healthy cranberry sauce. 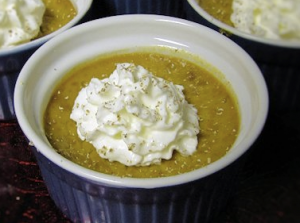 Served in acorn squash (what a super idea!). **Note: Adjust stuffing measurements accordingly depending on amount of people being served. 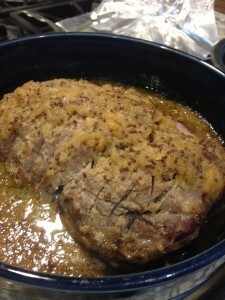 This stuffing filled a 16 lb turkey, as well as a 5 qt braising pan. Place bell pepper, mushrooms, and celery into skillet and saute. In a large mixing bowl, combine ground pork, onion, garlic, rosemary, thyme, sage, fennel seeds, anise, paprika, cayenne, salt, and pepper. Add ground pork mixture to skillet, and cook until pork is browned slightly. Remove from heat, and discard any liquid in the pan. Compliments of Primal Palate. Yummers. The holidays can be challenging for all of us–family drama, the big production of hosting the “holiday meal”, and trying to navigate food choices that derail all the hard work you’ve put into your health all year. I’ve got some recipes to share that can at least help with the two latter challenges. Brined Turkey: True, brining a turkey takes extra work, but dang, your bird will be so tender that you’ll find it is SO worth it! 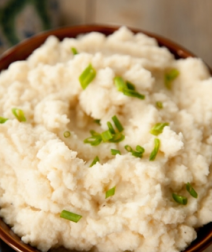 Mashed Cauliflower: Flavorful and super low in carbs, great alternative to mashed potatoes…or you can go half and half with cauliflower and potatoes. 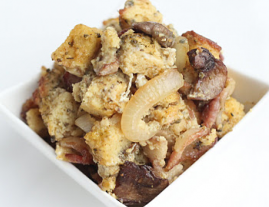 “Cornbread” Stuffing: Avoiding grains, gluten, or just trying to be kind to your blood sugar? 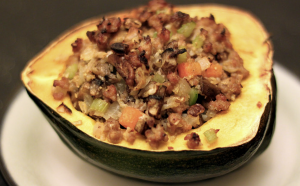 This stuffing is the way to go! Hope to see you at my FREE wellness class HEALTHY THROUGH THE HOLIDAYS, Wed, Nov 7th at 6pm at the west side New Leaf Community Markets! Register now.